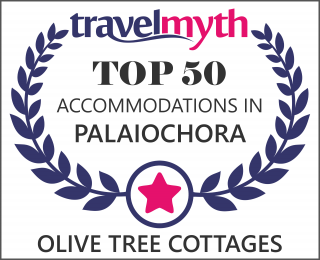 Olive Tree Cottages are situated on the east coast of the village of Paleochora Crete. The cottages offer comfortable and relaxing accommodation for your holidays in Crete. Access to the cottages is quite easy. When you arrive at Paleochora, you see on the left side of the road, an old hotel (Libycon) & the sign for the Camping Area. If you follow the east coast that skirts Paleochora's pebble beach, passes the churchyard & campside, then leaves the coastline & you can just, catch a glimpse, of the tilled roofs of the Cottages. They are peeping out, between green Olive Trees on the far side of the river bed & framed by the endless blue vistas of the Libyan sea.! This small complex has enormous character & located between Olive trees to provide maximum shade & privacy. The Cottages have been designed & construct by the owners, Georgia & Thomas, as that is their main business.